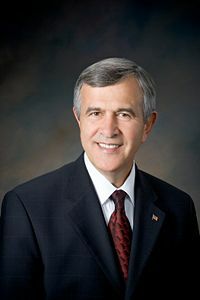 Michael Owen Johanns (born June 18, 1950) is a former United States Senator from Nebraska and a member of the Republican Party. Johanns was born in Osage, Iowa and grew up working on his family's dairy farm. He describes himself as "a farmer's son with an intense passion for agriculture." Johanns graduated from St. Mary's University of Minnesota in Winona, Minnesota. He earned a law degree from Creighton University in Omaha and practiced law in O'Neill and Lincoln, Nebraska. He is married to former State Senator Stephanie Johanns, they have two children and five grandchildren. Johanns began his career in local politics when he was elected to the Lancaster County Board as a Democrat from 1983 to 1987, and on the Lincoln City Council from 1989 to 1991. He registered as a Republican in 1988. Johanns was elected mayor of Lincoln in 1991 and was reelected in 1995 without opposition. Mike Johanns was elected Governor of Nebraska in 1998 by a 54%-46% margin. He was a strong advocate for rural communities and farmers and ranchers. In 2000, Johanns drafted the Meatpacking Industry Workers Bill of Rights. "The document covers health and safety issues, including the right to organize labor unions, the right to work in a safe place, the right to adequate equipment the right to information, and a right to training." A strong supporter of ethanol fuel, in 2001 he served as the chair of the Governors' Ethanol Coalition. He was easily reelected in 2002 with 69% of the vote. In 2005, Governor Johanns traveled across the country to hear first-hand from producers about what was working with current farm policy and what was not. Johanns hosted 21 of 52 farm bill forums held in 48 states. Johanns became the 28th Secretary of the U.S. Department of Agriculture in January 2005 after being nominated by President George W. Bush. He worked to expand foreign market access for U.S. producers and promoted the growth of the renewable fuels industry. One of his major accomplishments as Agriculture Secretary was developing the Food, Conservation, and Energy Act of 2008 which was a $288 billion, five-year agricultural policy that includes increased money for food stamps and support for the production of cellulosic ethanol. After Republican Senator Chuck Hagel announced his retirment in 2007, Johanns resigned as Agriculture Secretary to run for the his seat. In November 2008, he was elected with 58% of the vote. On February 12, 2009, Senator Johanns voted against the 789 billion economic stimulus plan. He voted with a majority of his Republican colleagues 91.9% of the time during a recent Congress. This page was last modified on 27 July 2016, at 12:29. This page has been accessed 5,596 times.